The Fierce Beagle: Yom Tov! While we were on a conference call with Israel's minister of tourism and their PR agency today, I noticed that we have a couple of giraffe sculptures in our conference room. Which reminded me about my vow to draw whatever animals (or animalish things) you guys requested. So today commences my little art experiment, this time in Technicolor, with "Gemma the Giraffe" (pen and crayon on lined paper) per request of the exceedingly cool Jennifer (AN ART TEACHER!) from Jen Loves Kev. You can click on the image to enlarge it and get a better look at Gemma. P.S. I did NOT draw this while on the phone with the minister. WOW! That is seriously impressive, lady! So the girl can write and illustrate. Huh. "So the girl can write and illustrate. Huh." All that is left for you to prove is that you can juggle and maybe walk on water and you achieve some level of blogger deity. Slamdunk—Well there's no doubt about it: I cannot juggle. Or whistle. I can however glide effortlessly through the water while wearing my swim cap. I felt like I was at the zoo. I didn't know the zoo really named their animals. I love the talent in both the way you put together your posts so full of wit and thought as well as your artistic abilities! Thanks for making the rest of us look bad. hahahahaha this totally made my day yesterday!! i love Gemma!! Great job! 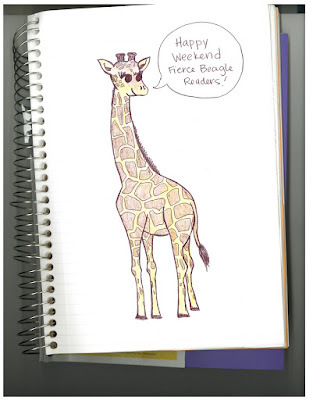 Thanks so much for the shout out and for drawing a giraffe for me! Natalie—I don't mean to make anyone look bad. My sole intention is to make myself look better. Jennifer (the second)—I actually used to want to do just that. Perhaps I should consider trying? Also, do they give the Pulitzer for children's books? Now I know what you were thinking the whole time you were on that call! You're so silly.